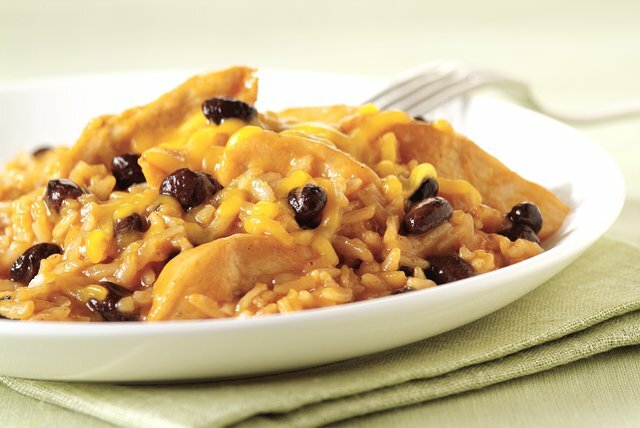 Chicken breast strips are simmered with instant rice, black beans and BBQ sauce in this cheesy weeknight-quick skillet dish. Cook and stir chicken in large skillet sprayed with cooking spray on medium-high heat 4 to 5 minutes or until cooked through. Stir in rice, barbecue sauce and water. Bring to boil. Reduce heat to low; cover. Simmer 5 minutes or until liquid is absorbed. Add beans and 1 cup of the cheese; mix lightly. Sprinkle with remaining 1/2 cup cheese; cover. Cook until cheese is melted. Prepare as directed, substituting 1 lb. ground beef for the chicken. Prepare as directed, substituting 1 pkg. (10 oz.) frozen whole kernel corn, thawed, for the chicken. Increase black beans to 1 can (15 oz. ).